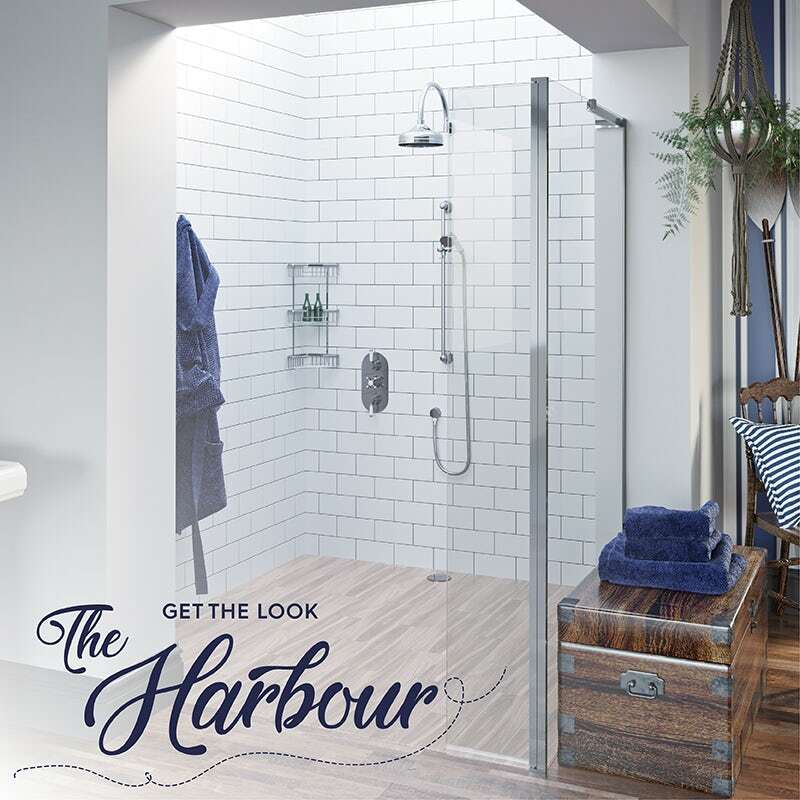 Welcome to part 2 of our latest “Get the look” style guide, where I’ll be showing you the type of products you’ll need to achieve The Harbour look in your bathroom. My name’s Nicky and I’m the resident stylist at VictoriaPlum.com. In part 1, I introduced the look and explained the differences between this style and other nautical designs. If you haven’t done so already, read this article first and discover the background behind the look. Click on the image below to begin. The products you choose for any type of bathroom design are crucial in achieving your desired look. However, to create a sense of balance and harmony, the products you choose need to complement each other, which is what this article is all about. Ready to embark on your creative journey? It’s time to weigh anchor and get underway, by focusing in on those individual elements that really make this look work. Freestanding baths have been gaining in popularity for years as homeowners yearn for a more relaxing and luxurious bathing experience, forming the foundation for many a bathroom design. 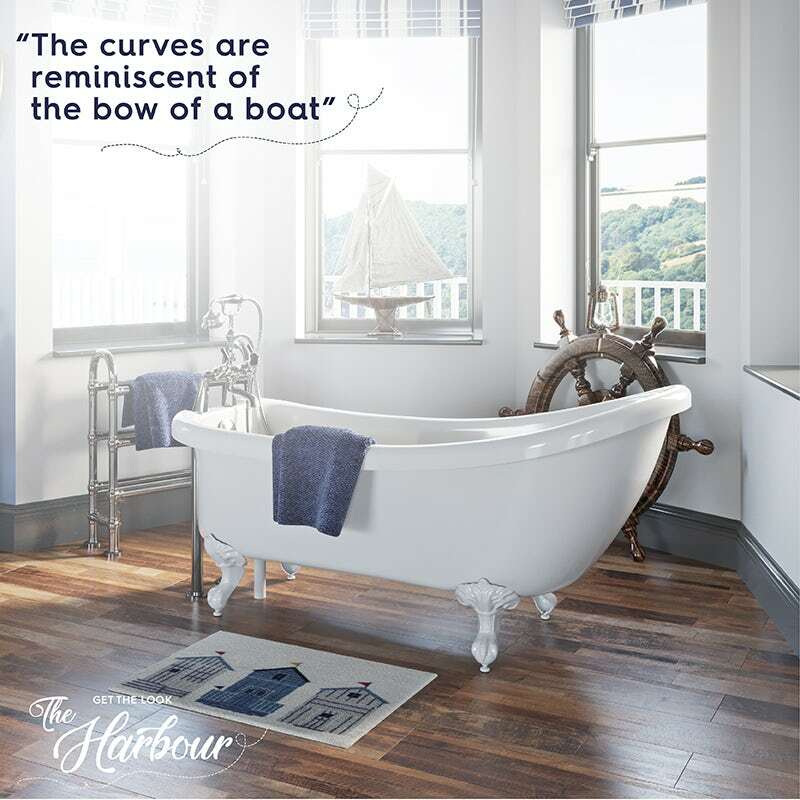 For The Harbour look, we’ve headed straight for one of the classics, with a traditional slipper bath. The great thing about this design is that the curves are reminiscent of the bow of a boat. We’ve opted for white feet which give a pristine appearance, although you could just as easily choose chrome. A blue coloured bath would also fit well with this design. If you don’t have the space for a freestanding tub, there are other traditional alternatives you could consider, including back to wall baths or traditional straight baths. The classic style will really set the tone for the other products in your bathroom, as we shall see below. If you have the luxury of a spacious bathroom, you could double up and add a shower enclosure to your scheme. Although, in most average-sized bathrooms, you’ll most likely have to choose one over the other. If you opt for a shower, like we have in our room set, you can easily combine both traditional and contemporary elements in the one installation. 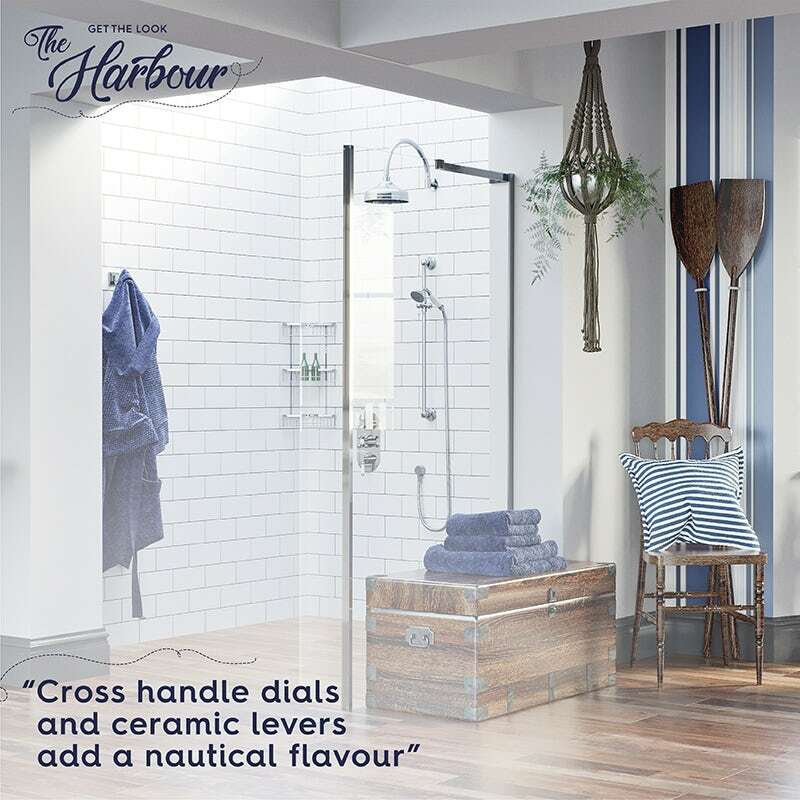 First the traditional: Look for a shower set that features classic cross handle dials and ceramic levers for a look that certainly has a touch of the nautical about it. A concealed valve in sparkling chrome will keep things streamlined, whilst a hooped wall arm will add to the elegance. Next, the contemporary: With a walk in shower, you can keep things feeling bright and airy, rather than stuffy and confined. This will certainly enhance the look. If you have the budget, go one better and create a wet room enclosure, as we have done in our room set. This provides level access, which is great if you have restricted mobility, whilst giving your bathroom an uninterrupted look, with your flooring extending right into your shower area. White metro tiles combined with white grout bring these two styles together, adding contrast to your room. 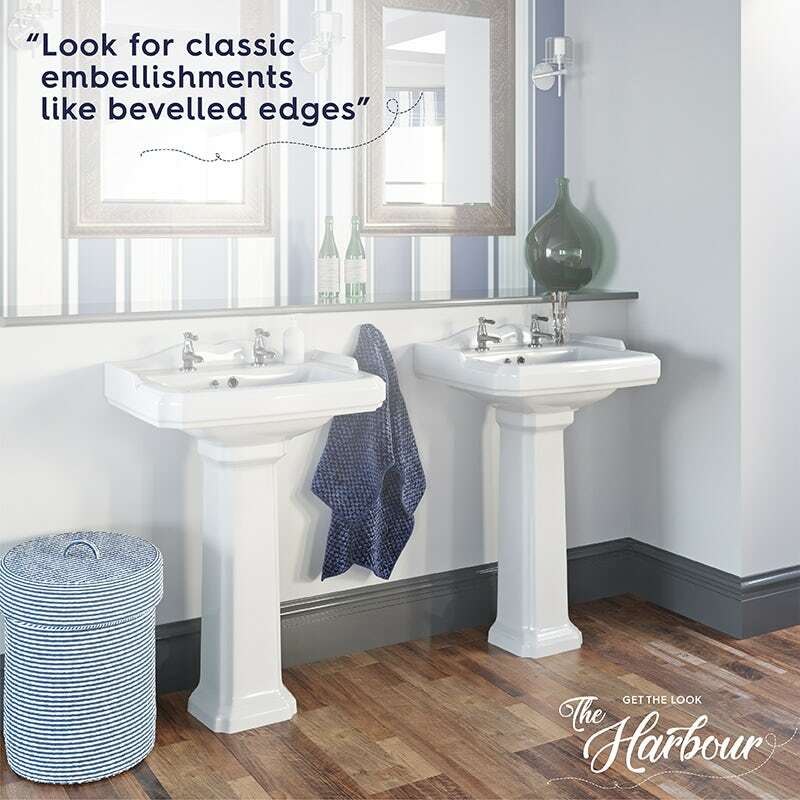 Continuing with the traditional theme, look for a basin that features classic embellishments such as bevelled edges, a surround and a plug and chain style waste. Generally, traditional style basins are square in shape, rather than rounded, so, despite the rounded shapes of your bath and toilet, don’t be put off by this type of design. If you have the room, double up on your basins, providing an excellent way to share your bathroom space with your fellow shipmates. Combining the more functional, almost industrial style, with a classic and refined look can be achieved through your choice of taps. 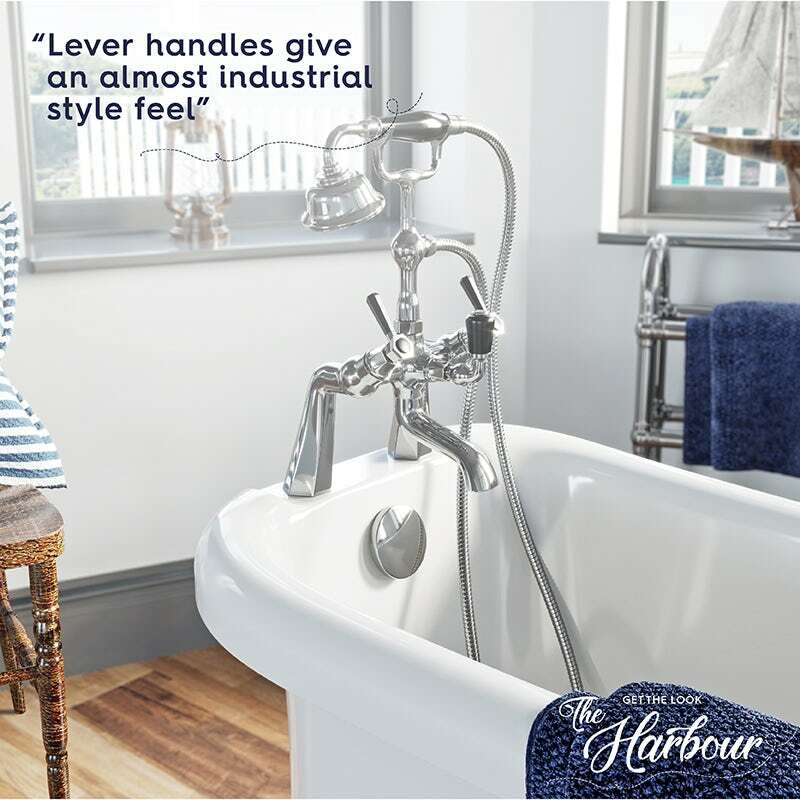 Lever style handles are, again, reminiscent of the type of equipment you may very well find aboard a yacht or boat. They will also echo the design of your shower. Whilst white ceramic handles are most common, you could also choose to add to your accent colour with a different shade. In this instance, we’ve gone with black to complement the monochrome elements of our chosen palette. Fancy going on a voyage of discovery? Why not find out how these taps are made? Your choice of toilet should be in-keeping with the rest of your suite, so make sure you go for something that matches your basin or bath. Ideally, buy from the same bathroom collection for a coordinated look. Close coupled toilets are the most common type, however, a high level toilet with chain pull flush will add a certain traditional charm to your overall bathroom design. Make part 3 of this style guide your next port of call, where I’ll be demonstrating how to accessorise your bathroom with the right colours, tiles and textures, to bring this look to life. If you haven’t done so already, I’d suggest beginning with part 1 and working your way through. Click on the image below to head there now.